We're back in the wasteland with new updates! This time around we've started making progress on the pathfinding algorithms of the game. 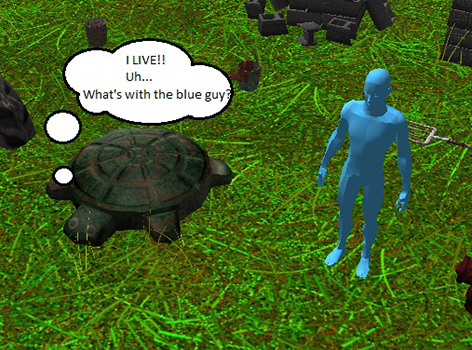 We now have an avatar that moves around the map, avoiding obstacles! Our health screen has greatly improved! Nice work Margaret! We're also working on various other GUI screens as well. 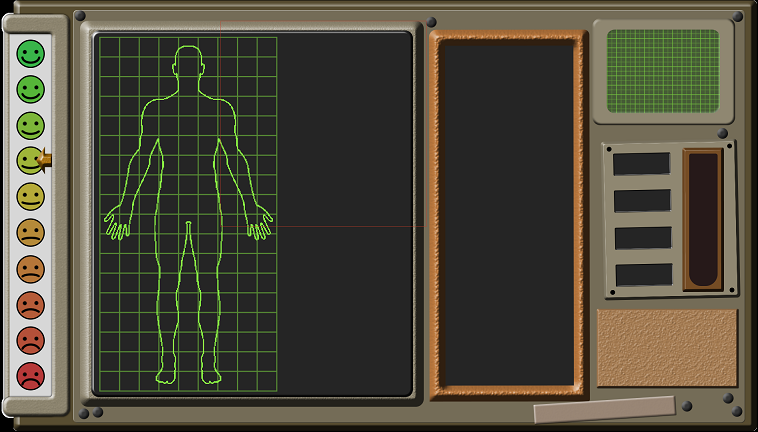 Many of the features of this screen will not be evident until it is hooked up into the game, but the various widgets will show the aspects of your character's health. 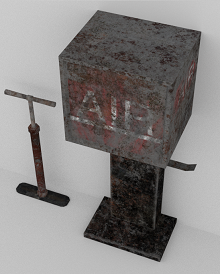 Here are some more shots of various objects created for the game, courtesy of Paul and Alberto. We've also started working on the wallsets for the game. Here we see the initial markups of several walls. We're still modifying the dimensions, but it's an excellent start! Lastly, we have some of the basic floor tiles being created. Here is a cement slab, created by Dakota. Our time has been highly productive. On the programming front, a large amount of effort has gone into overhauling and expanding our asset editor to include various features like ray-targeting cages, build and movement outline restrictions and so forth. We've adopted a color scheme similar to our main company website (DMG main site), primarily because these editors will ultimately be used to create other games than just Fall of Atom and its successors. Here, we see an image of a picnic table (created ages ago by Paul) surrounded by a blue cage made of small boxes. 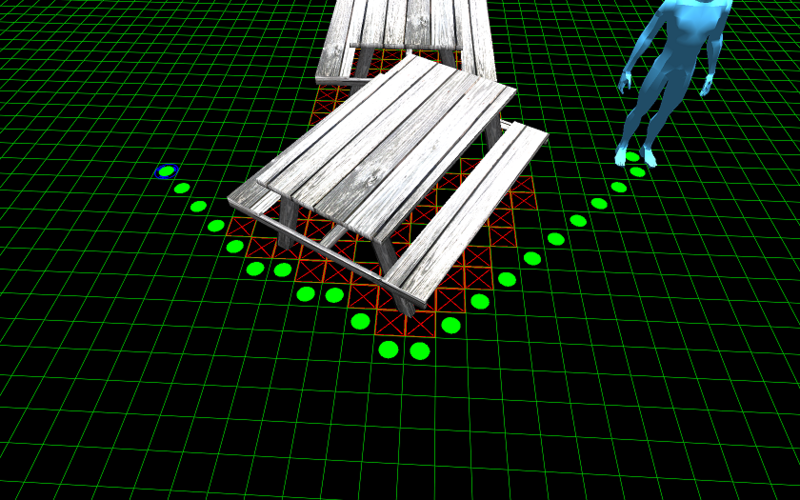 These boxes outline the places where the mouse will detect the picnic table (using a technique in ray-targeting called OBB or "object bounding box"). With that technique, an invisible ray is projected into the screen straight down from the mouse cursor and through the scene. If the ray intersects any of the boxes, the object will register a "hit." Here we see screenshots demonstrating this idea. While there are far more sophisticated methods of object detection, higher precision results in lower performance, so we're using the OBB method. 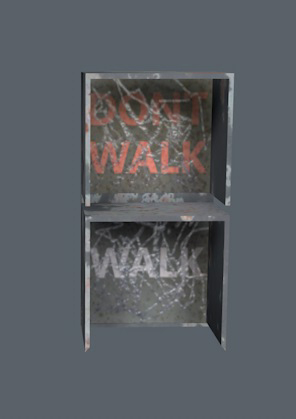 On the object front, we've had a lot of meshes and textures created since we last posted. 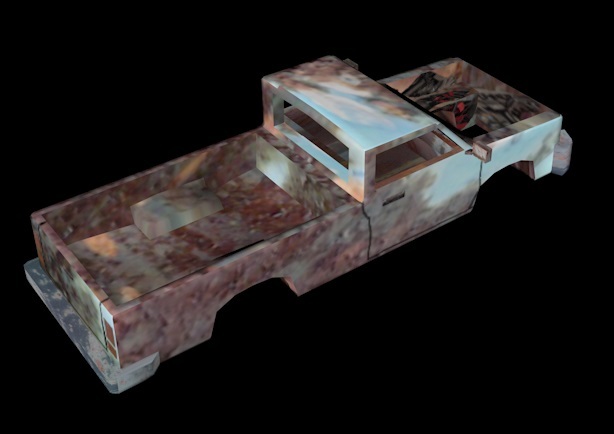 Here is an image of an old pickup truck that Paul is creating and several stumps made by Alberto. Alberto is currently working on a vast array of vegetation for the game, so we'll have some cool wilderness map pictures coming up in near-future posts. Margaret is making progress with several creature concepts and UI screen for the character medical conditions. 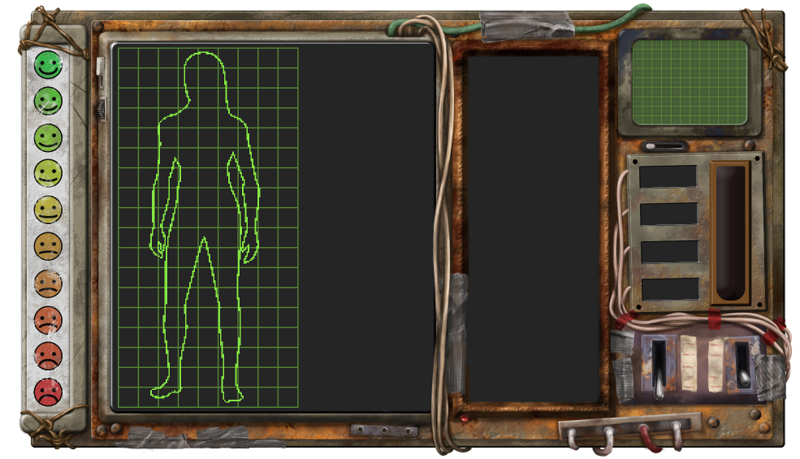 For spoiler purposes, we'll leave the creature concepts out for now, but here is a rough outline of the health screen. It's just the basic concept. The entire screen needs to be rusted out, cracked, dirty and with wires hanging out before it's done. We'll take it out back and bust it up for a while. On this screen, you can see some of the elements that will be going into the game. For instance, on the left-hand side, you can see a pain scale often used in the medical field. As your character accumulates injuries, his/her level of pain will increase, which will adversely affect skills. Pain killers will be in the game, but taking them will affect how clearly your character can think and reason. On the top right of the screen will be an EKG tracer, which will give you an idea of how fast your character's heart is beating. Terror will be a serious mechanism in the game, and your heartbeat will be one reflection of fear. It will also go up if you bleed too much. More on all that stuff later. 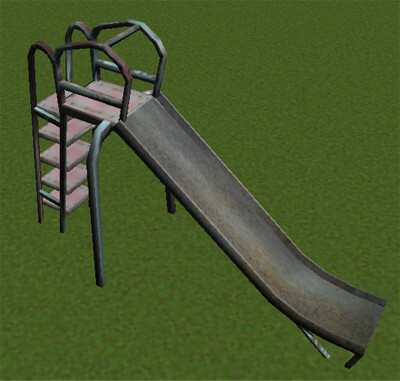 Lastly, Clayton is working on several tracks to be included in the game, with an example posted here. Check back again later. Game creation is a very interesting and extremely difficult venture, especially when you are building everything from scratch! Welcome back to the Cleveland Wasteland! The heat is sweltering and our food reserves are souring rapidly. We found some rats this morning, so today we eat like kings. 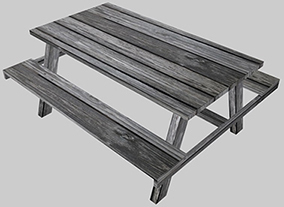 ... and here are a few images of the full screen, showing part of an old couch and telephone pole that Alberto created. Well that's it for now. Back to the programming! 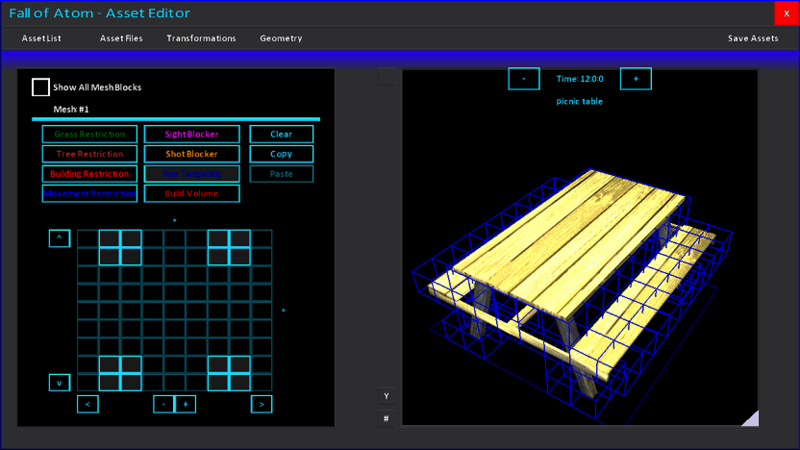 We're making strides creating the first of our UI screens, shown here. 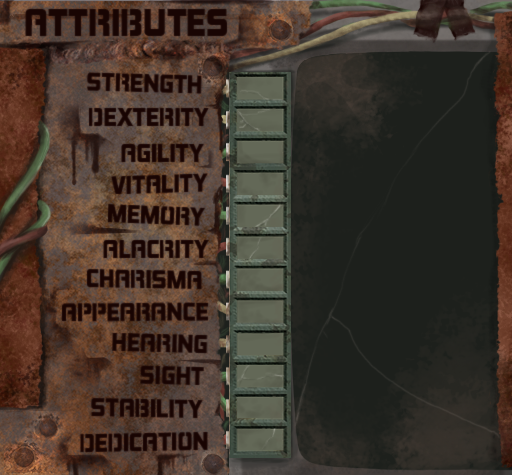 It's part of what will eventually become the Attribute-Skills screen, by Margaret. It will likely be modified quite a bit before the game is finally released, but this gives you an idea of what we're shooting for. Once we scavange more parts for it, we'll post another shot, but it's been over fifty years since this stuff was made. It's hard finding anything that works out there in the wastes. We have another audio sample from the talented Clayton, a sound glimpse of some battle music. Very nice! 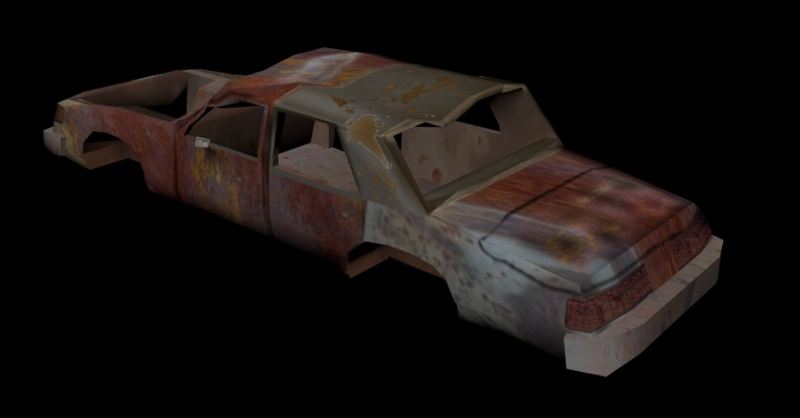 We have a shot of a car that Paul is working on, as well as an image of some of the countertops and shelving units Alberto is creating for game. It's developing very nicely! 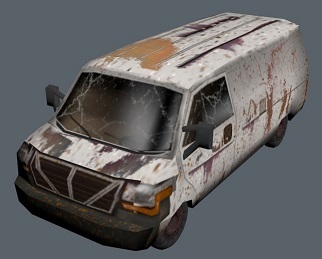 Paul will be working on most of the cars in the game, and Alberto will be covering most of the objects found inside homes. Also, here is a quick update from the coding department: Dr Ickes is dividing the project into smaller pieces to facilitate work with another programmer. The image shows a few of the program divisions. The green check mark indicates completion of the separation process. 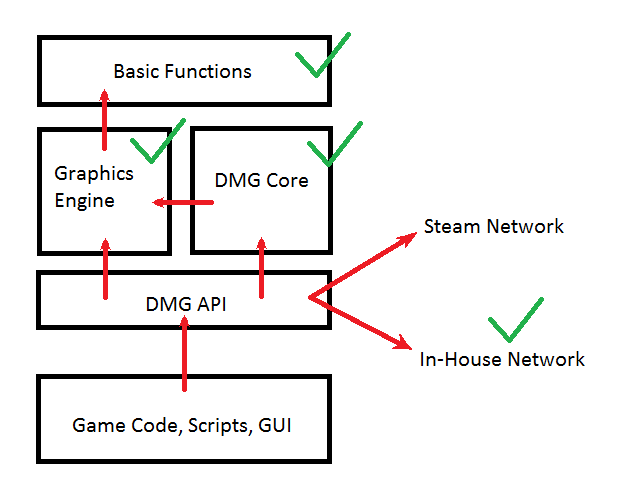 Most of the individual areas have significant code completed, such as the In-House Networking and the graphics engine. Once this process is finished, we'll be returning to work more of the editors, such as the Dialog Editor presented in the previous blog. Well, that's all for now. Stay tuned and be careful out there in the Cleveland wasteland! Time flies in the Wasteland, especially when you have to scrounge for food and supplies. Our little company has had some rough times, and we've finally made it back around to scribble our survival notes on the blog. This time around, we are happy to announce that we've recruited a highly talented musician to our ranks, Clayton Stroup from the wastelands of Texas. His signal is very faint over the vast planes of desolation, but he's already submitted several excellent audio tracks for the game. Here is a sample of his first track. 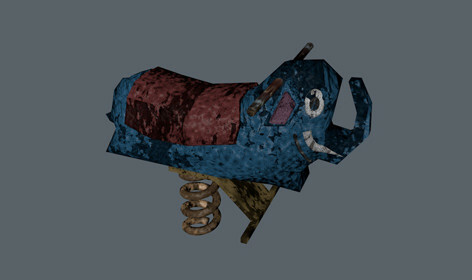 Our quest to fill the game with cool 3D objects continues, with a few snapshots here. There have been far too many created since our last blog to post them all. These are not to scale of course. The first three are various objects created by Paul. The second three are from Alberto. 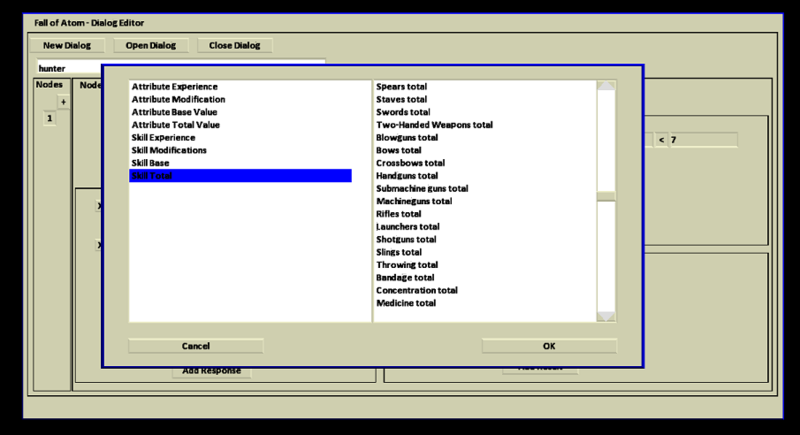 On the programming front, Dr. Ickes has the code for the GUI screens completed, creating a dialog editor in the process. These particular screens don't look like much, but they were created from scratch within our engine. While there are some coding libraries out there that help to create user interface screens, Harold is far too thick-headed and stubborn. He prefers the challenge. At any rate, skins can easily be applied to dialog screens such as these, allowing the team to create all the professional-looking menus the game will eventually have. The plan from here is to use the GUI architecture to create the various editors we'll need to bring the wasteland to you. It's a very dynamic time for us. We'll see you up ahead. Time for an update! 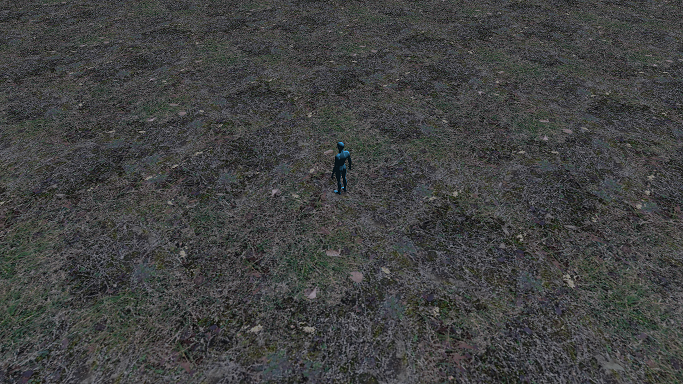 We've made great progress in our quest to simulate grassy planes. 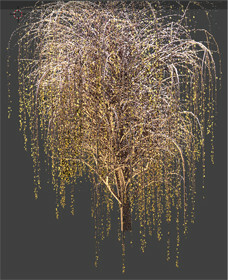 A number of individual grassy blade models were uploaded into the engine and used to generate a clump of grass. 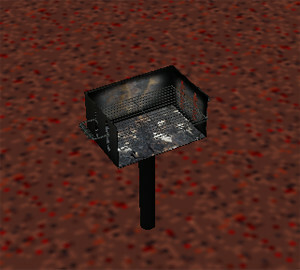 A screenshot of the models were taken to generate a texture, which was then used in the engine for billboard style grass. We also improved upon the underlying grassy matting that serves as the floor for the grassy field scenes. We've had a number of other objects uploaded into the engine as well, such as an old van by Paul and a series of camp objects by Alberto, shown here in these shots. We'll be adding a large number of different grasses that are resident to the NE Ohio area soon. In addition, Ryan is making solid progress on our item editor. Hopefully we'll have some screenshot of it soon as well. Lastly, Margaret has submitted some concept art for our beastiary collection. You can see them on our 'pix' page. Another quick update from the DMG stronghold! Dr Ickes is still at work mastering the art of getting grass to show properly in the game engine. 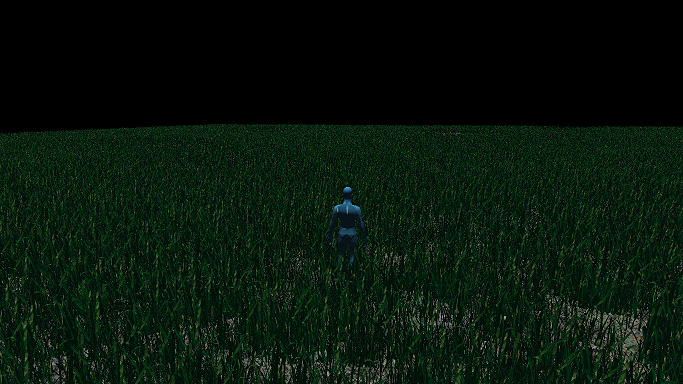 Here is a screenshot of the grass from nearly horizontal level, the blue man being a scaling measure. Please note that the game is intended to be top-down. This screenshot is purely for engine debugging purposes, but it should hopefully represent the progress that we've made. More to come! He's still making improvements to the process, so hopefully soon we'll have thriving field scenes. We're making more strides. 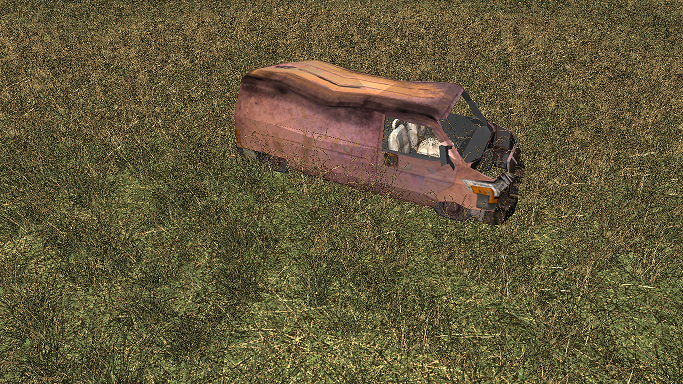 Paul has been working on our first vehicle in the game, the van pictured here. 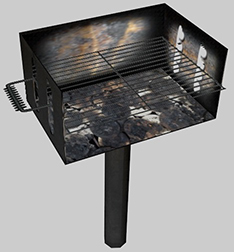 We�re going to have a much more run-down version soon. 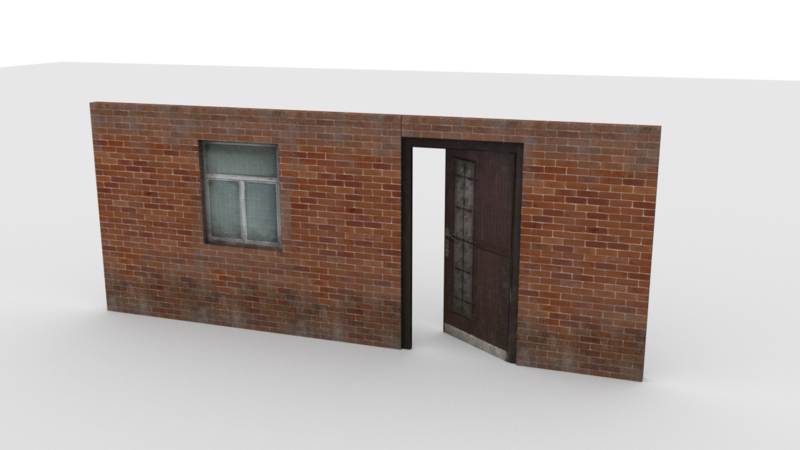 The art of making objects look like they�ve been sitting out in the elements for 50 years is a bit harder than we expected, but we're getting there! 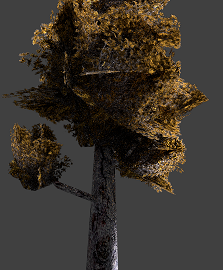 The learning curve with OpenGL has begun to direct us away from the beautiful trees that Tye produced originally, mainly because of frame rate issues. 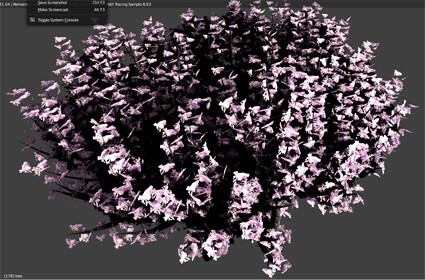 She�s perfecting her technique and creating vegetation using what appears to be the industry standard: simple interlocking polygons decorated with detailed leaf and branch artwork. We've even noticed some tricks to drawing grass much faster than originally attempted. It�s amazing what you notice when you look at how other games handle these things . . . the shortcuts they take to create great scenes! Also in these past few days, we've made some modifications to the website, mainly the header and posted new position openings. We're going to be expanding our membership interest in the direction of a 3D animator with rigging experience and a general 2D artist. If you have skills in these areas (or know someone that does), send us a link to a portfolio! 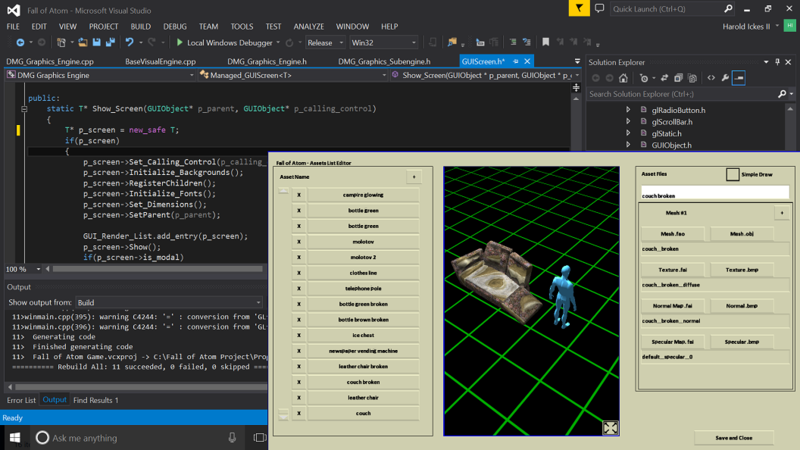 Ryan will have some updates soon with his Item Editor he is creating for Fall of Atom. This is an energetic group and things are moving quickly, so check back regularly. We've been away from the blog for a short while but very busy on the game! The engine is back together after some changes to compute shaders, geometry shaders, culling techniques and batched drawing. Harold has coded his fingers down to nubs! Much of the objects created over the last few months have been uploaded into the engine and are being tested, with excellent results. In addition to these changes, he's almost done with an orthographic mode which will allow the group to greatly improve the production of tile assets as well as create the possibility of using the engine for small 2D games. 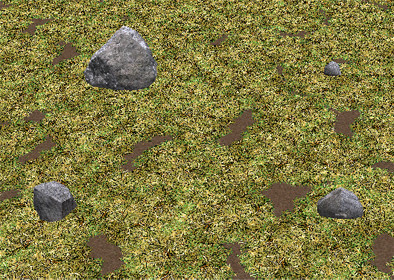 Harold has made some initial passes at grass tile, with... uh... results. *Sigh* Coders trying to be artists! How cute! Ryan has officially started work on an item editor for the game, which will modify the background data involved in making the world of Fall of Atom come alive, such as item weight, basic cost, condition, offensive stats, defensive stats, and a whole slew of data making sure the object is generated only in appropriate places in the game. "Why is this rocket launcher in a shoebox next to a teddy bear and weather satellite?"" In discussion for some time, we are now seeking one or more 2D digital artists for our group! We are looking for people who are passionate about making computer art, mainly for GUI screen skins, such as those displayed in our very first blog post! These GUI graphics will be used in-game and on the website. 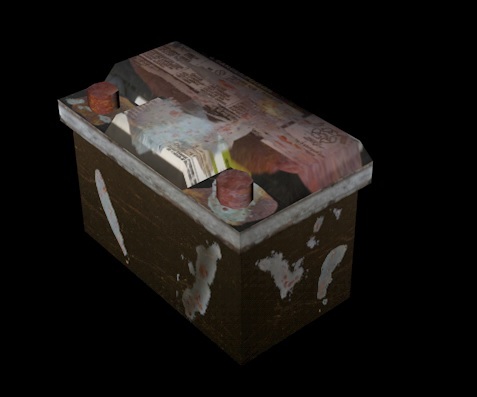 Other artistry will be needed as well, such as portrait drawings and general texture work. Please see our side page for a full position description. Finally, we've published a Developer's Timeline that we are holding ourselves to. It can be found here. Our goal is to push these deadlines ahead and never back! Time for a quick update! We're currently working on some engine efficiency improvements, pushing the envelope on a 60 FPS goal. 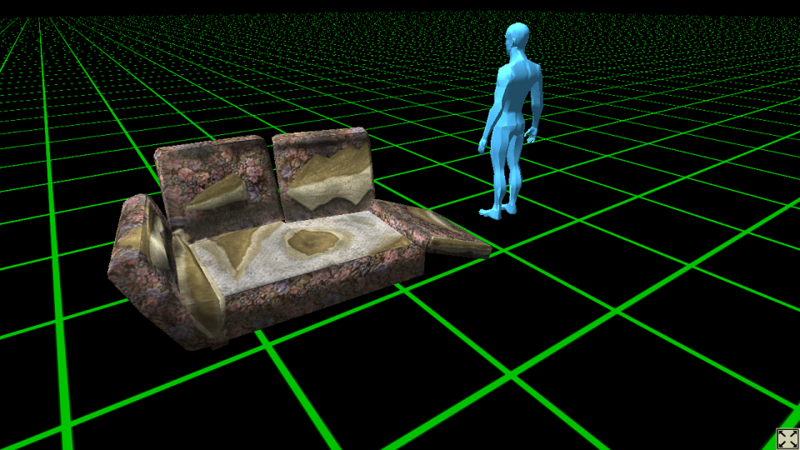 We're knee-deep in OpenGL/GLSL research and will hopefully be done soon. 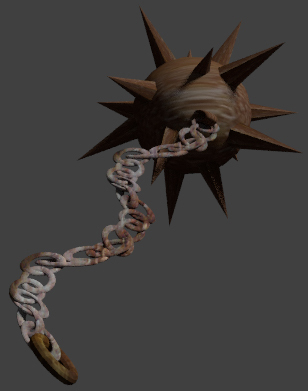 Object creation is ongoing, with some of Paul's traffic lights and gas pump, Alberto's gas-meters and this excellent ball-and-chain, by Tye. Time for a quick update! 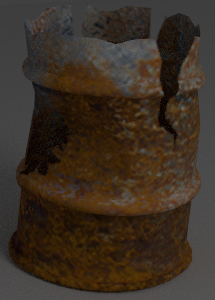 Since our last blog entry, we�ve been continuing our work with various objects in the game, such as this shot of an excellent rusted barrel created by Alberto. In addition, Harold completed some new artwork for the website, posted here for a sample. He's still hard at work on the GUI elements of the game as well. Most of his work deals with behind-the-scenes editing dialog boxes that the team will be using to create the game maps, imports objects into the engine quickly, debug the game, etc. Ryan, our Webmaster, is brewing up some changes using PHP. We're all excited for the renovations! It's been a little while since our last update, but we�ve been hard at work on FoA! 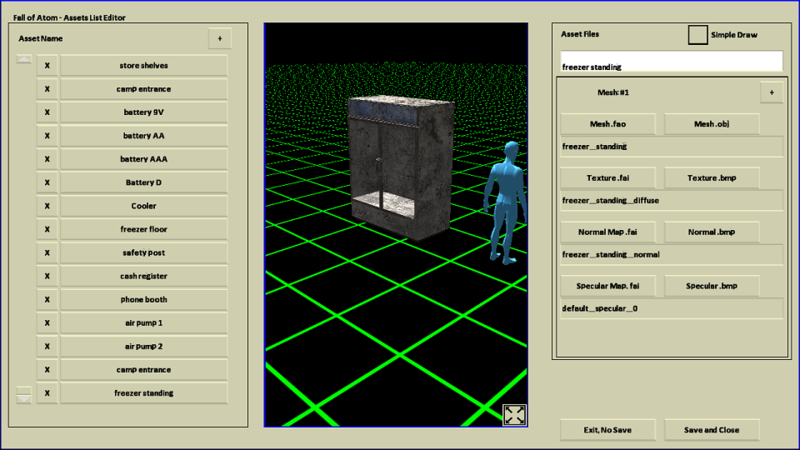 Dr Ickes has fixed a lighting bug and made rapid progress toward a new way to dynamically upload objects and images into the engine. 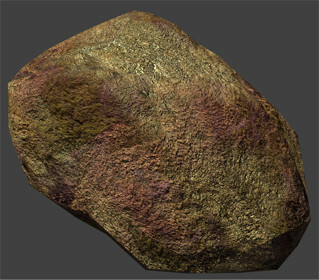 William, our storyteller and writer, has also tried his hand at object design, creating stunning examples of various rocks that will be found in the game. In addition, we have some other excellent models (some still in progress) submitted by various members. 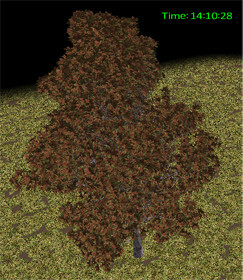 Paul's playground elephant-on-a-spring is one example as are several trees created by one of our digital gardeners, Tye. Adding to this growing list are several small plants submitted by Alberto. They are still being uploaded into the engine, but behind-the-scenes images look awesome! Last but not least, Ryan is hard at work on our future forum page, researching all the necessary code to put it in place. Stay tuned! We'll have more updates soon! We have a quick update for today. We've been working on some of the basic ground and vegetation elements as well as some tweaking of lighting for the system. 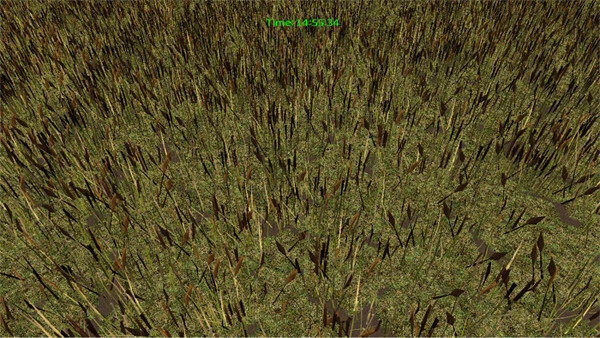 Here is a screenshot of a field with randomly placed long grass/cattail plants that are being developed. 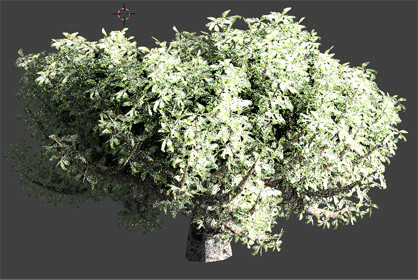 We'll be adding a ton of vegetation soon, so check back for more screenshots! In addition, Harold is hard at work programming some basic GUI screen elements for developer screens. 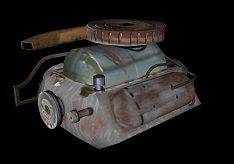 Soon all the team members will have versions of the engine to interact with directly. We had more exciting advancements today! Several new models were submitted, including a slide and a swing set by Paul as well as several trees by our new member Alberto. We're still having a few minor issues regarding a 'transparency glow' and some technical problems with a stubborn computer, but we're fast approaching a fix for these problems. The first draft of the design document is nearing its completion and will be distributed across the team members very soon. Plans have been laid down for more work in the upcoming week, including some concept art by Margaret, more 3D models by Paul, Tye and Alberto, and story development by William. Last but not least, Ryan is hard at work fixing up the website as well as the hidden test website that we will be revealing in the near future. Finally, we thought of some ideas for how our supporters can get their names into the game as NPCs, or as etching onto monuments, tombstones, etc. Exciting times are ahead! 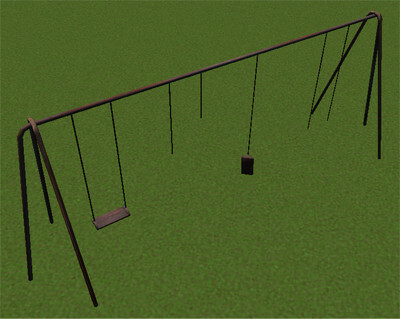 Here's a screenshot of the slide and swing set. 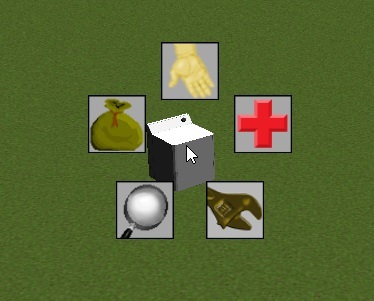 We have a few new items imported into the engine! They're looking good too. A new technique used by Paul that will speed up his creative mind and progress is fully seen with this grill and hoop. 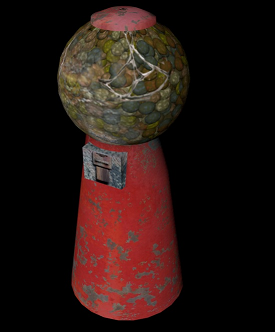 Here are a few more objects that Paul created that are within the game engine as well. It's official!!! Two new individuals have joined our digital pulse with introductions arriving in the next few weeks. 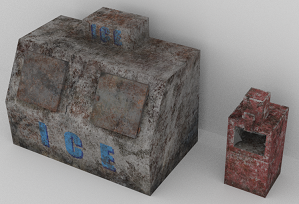 They will be working on 3D assets so that we can bring the wasteland to life. We had a weekend meeting and discussed the progress we have been making. Our screen shots are still a bit limited, but this will change soon! Our new members will assist in making that so. We have worked through more of the back story, and the new site is still going through major changes. Today you see that we have made a few minor changes here, which is pretty cool. Our development has been progressing. We have recently made some changes of roles within the company due to interests and skills. A new website is in the process of being developed, which will include some interesting social networking capabilities. We have gained a few new members to our crew, which will be introduced to everyone in the near future. We are hoping that even before the new site is up and going that our existing site will be updated more frequently. Even with this quick blurb, new updates are forthcoming, with greater detail and excitement! We've had slow developments as of late. The dust from the real-life wasteland is particularly thick for many of us at this time. 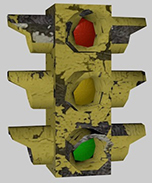 We're actively working on a new logo for this page and are continuing to work on 3D object development. Among the items we're creating are a breakfront, a slide, a turtle sandbox, and a postal dropoff box, to name a few. We'll have more updates in a few weeks. We've had some excellent developments in the game engine. 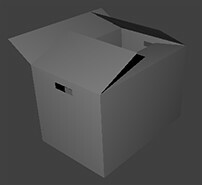 The OpenGL drawing now uses indexed VBOs, and we've upgraded to using normal mapping. The image below shows a test of a sphere submerged in a green surface. The left sphere shows a basic diffuse lighting. 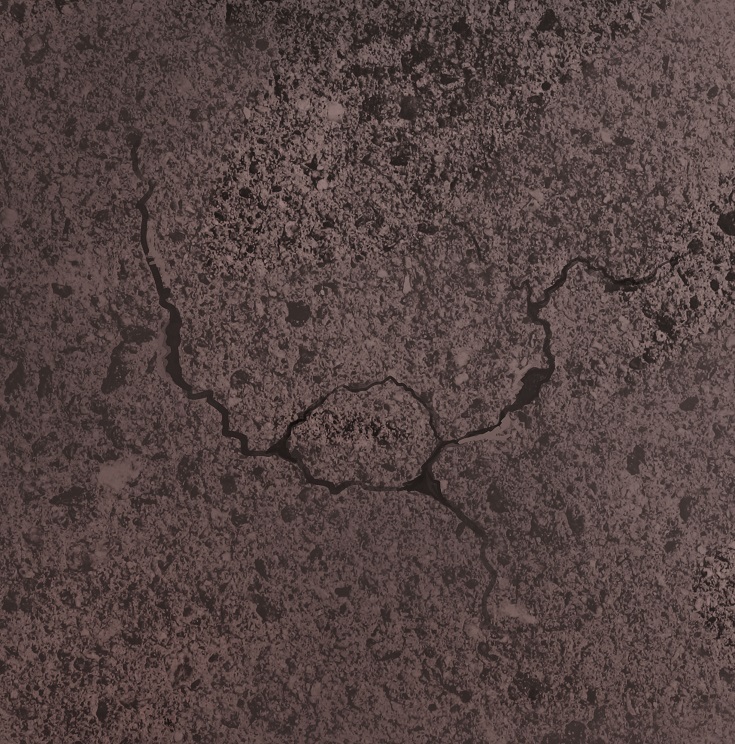 The central shows diffuse plus specular light, (the glossy reflection). The right image shows the upgrade we've completed. 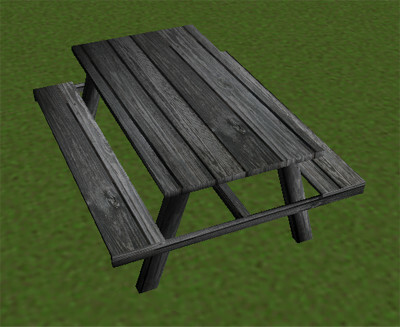 Surfaces can now be displayed as having a textured 3D surface. The number of objects we have are increasing dramatically. 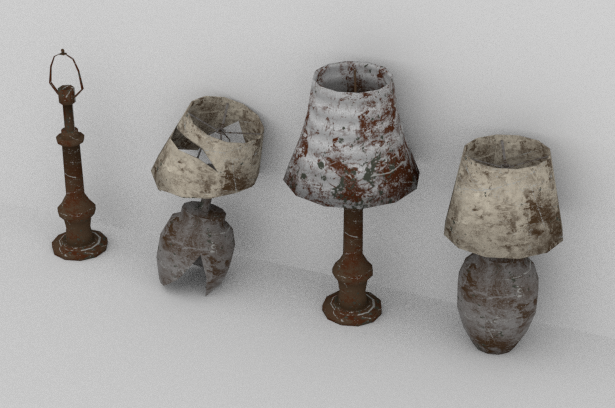 Here are several objects created by Paul in the last week. 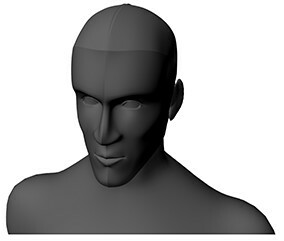 Finally, we also have our first avatar for the game, the male PC, shown here in a relaxed pose. 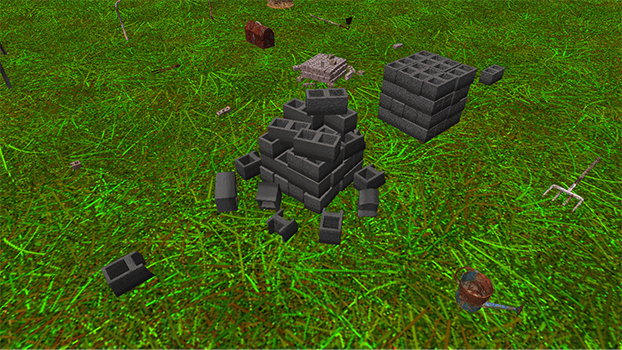 We now have the ability to import objects into our engine! 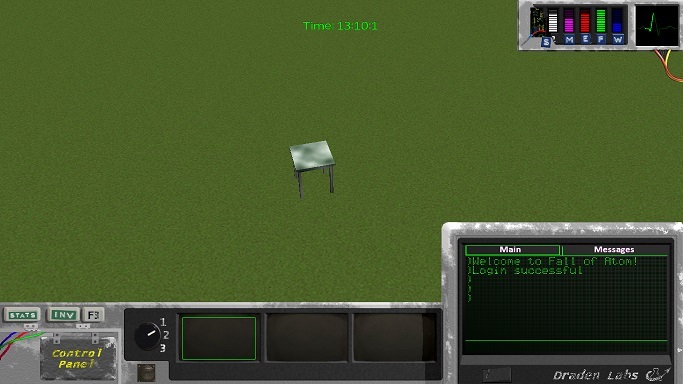 The included screenshot shows our first object, a table created by Ryan. 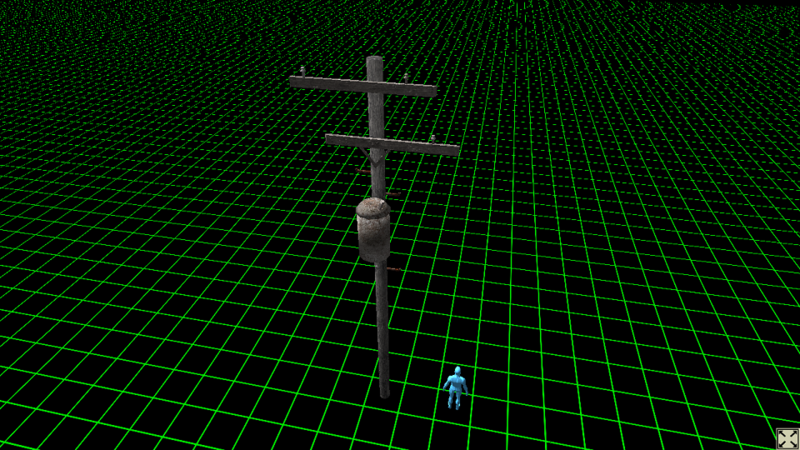 At this stage, we have only simple lighting effects in place and a few temporary textures, so it looks fairly basic. In addition, we also have the ray targetting hooked up, which allows the mouse to interact with the graphics engine. 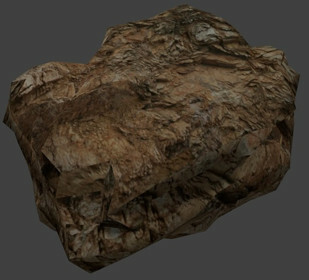 Each object in the game, from the walls down to the rocks, will have some level of interaction. 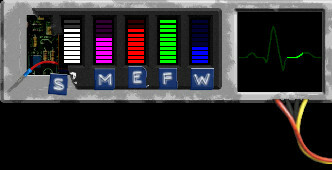 The image included shows a simple radial mini menu that appears around the mouse cursor upon right click. 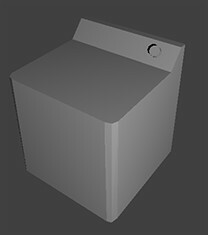 The object is the washer you may recognize from the July 28th entry. The menu images are placeholders and will be upgraded when our artist has the time. 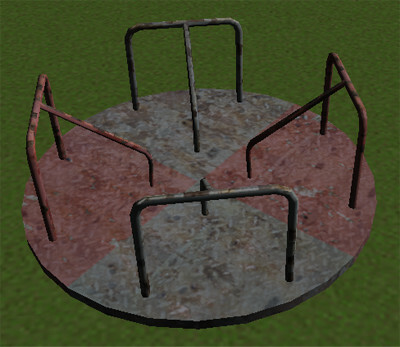 The radial menu will display different options depending on the object that is clicked. 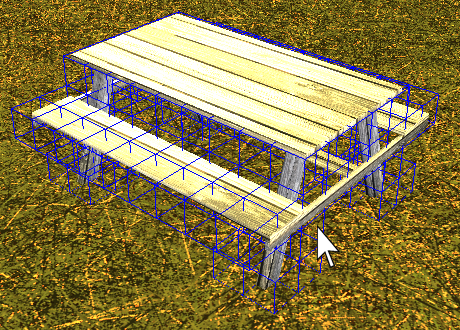 Our team is hard at work constructing more object meshes and streamlining the process of UV-mapping (i.e. applying the skin to objects). The next task is to upgrade the lighting system some more. We're continuing our progress on upgrading the graphics engine, revamping the lighting system and switching over from an older style of drawing objects to indexed VBOs. Each of us are up against a learning curve and the dust from the wasteland keeps getting stuck in our keyboards. Most of us have joined in on the object creation process as we're trying to build our database of items quickly. 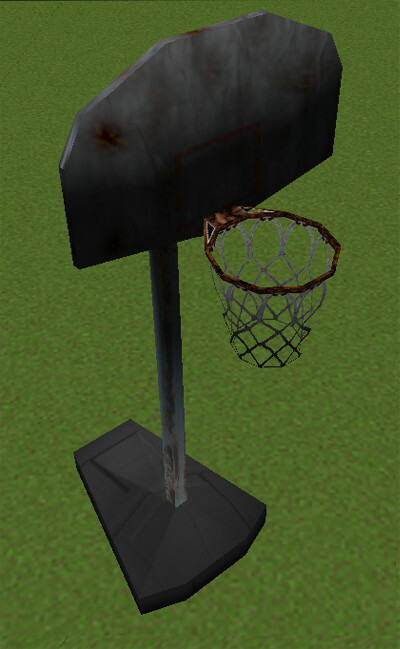 It's not much yet, but here are a few small mesh screenshots. 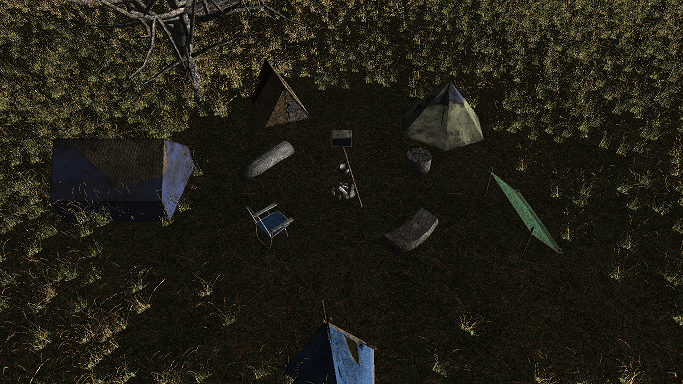 We're tackling a major task of getting the objects into our engine, so we wont have any in-game screenshots yet. We've also upgraded our website. Dr Ickes has been monkeying around with Photoshop and created our first header for the FoA website. Our company became a legal entity today, formed from a group of highly talented and motivated individuals with a wide range of backgrounds from medicine, physics, chemistry, biology, professional writing, game design, graphics arts, web design and pure grit and stubbornness. Our first project, Fall of Atom (FoA), has also started. Many of its coding aspects were already in place, having been written gradually over the course of ten years. The basics for the graphics engine for FoA is written in OpenGL from the ground up, so we already have a working basis to start from. 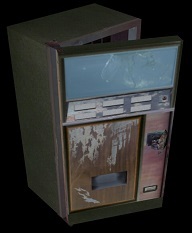 At this point, we have an empty database of objects and images for the game except for some prototype dialog screens, so screenshots would not do the engine much justice. Here are a few of the dialog screen images nonetheless. 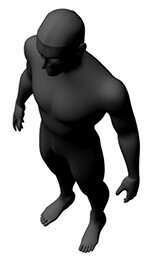 Our focus from here will be on 1) upgrading the graphics engine to enable some of the modern techniques and shader effects, 2) creating a large database of graphical 3D objects for the game, 3) and creating the first animated character in the game (a male PC). In addition, one member of the group, William, will be dedicated entirely to story background, quest design and cultural development of the various groups in post-apocalyptic Cleveland (and surrounding areas).